Sankyo Reels, will be participating in the "automechanika Shanghai 2012 "
Our group company in China has employed a booth design with a beautiful streamlined shape. There, we will display our main products such as various reels, reel boxes as usual. Also this time, you will find Lube products that we added to our product line up just 2 years ago, and we are honored to receive appreciation from many customers. Please take opportunity to discover our great range of product line-up. What is exciting to announce is that, we had chance to settle a reception booth in the “Japan Pavilion” that is organized by JETRO (Japan External Trade Organization) and composed by more than 20 Japanese manufacturers. Many of our customers say that the trust in “Made in Japan” is still strong through the markets of all over the world and I heard that visitors of international trade shows go first, to the “Japan Pavilion”. 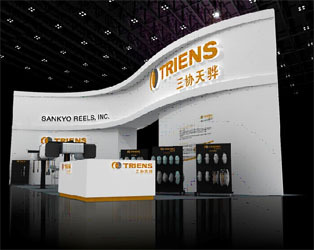 We Sankyo Reels, Inc. Head Quarter are looking forward to welcoming at our reception booth. As you may know, the People's Republic of China selected a new national leader recently, and the whole world pays attention to its continuing economic growth. 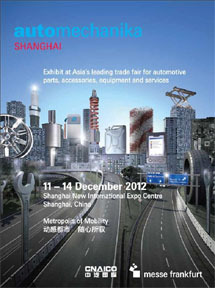 We suggest you to come see the auto maintenance market of this country at renaissance.